black currant, berry, licorice, spicy, drinkable now, red, medium, stones, cellarable, easy drinking. This wine exposes the fresh, ripe, jam-like fruit that is the calling card of California wine. Three saucy grapes make up the blend. Zinfandel adds a juicy character, Merlot mellows and Cabernet adds backbone. Forward, spicy and soft, this delicious dalliance makes the perfect trio. Keenan Merlot is composed of sixty-eight percent Keenan Estate Merlot. Thirty-two percent of the wine is Merlot fruit harvested from the Napa Carneros region. After hand harvesting, the grapes were de-stemmed, then inoculated with Montrachet yeast. Fermentation ranged from eight to twelve days before pressing. Hints of violets and a fabulous spiciness show in the nose, a chocolaty creaminess combines with the rich fruit on the palette, and the finish is long, deep, and elegant. Drink now or decades from now. The 2004 Merlot (which includes 3% Cabernet Franc) is a dense, rich, concentrated effort boasting a dark ruby/purple color along with plenty of black cherry and currant fruit intermixed with espresso roast and earth notes. "This lush, dark ruby wine reveals an array of spice and fruit aromas such as black cherry, raspberry, black pepper and cinnamon, mingled with cocoa, mineral and toasty vanilla notes. 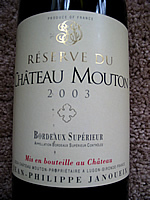 The palate is rich and concentrated with strong cherry flavors, firm tannins and a fruity finish. Beautifully balanced and full-bodied, this wine will age for many years."